Once a while I am stopping by the suiseki forum and look up the posts. I noticed one post "shortcuts to stone treatment, not for everyone", and it seems that for many on the forum it's not clear which way to treat stones is the right way. I tried to register but it didn't work out. Maybe I can help with some information. It would be great if you could publish it - of course if you want to. In general, every culture is having different opinion or roles about stones and stone treatment. In China stones are altered, cut, brushed polished, oiled, waxed and that's normal. By the way in China they are very upset if somebody calls a Chinese stone suiseki. Suiseki is a very Japanese art concept. However, in Japan treatment of stones is called Yôseki. The word Yô is also used in the term for bringing up children. So Yôseki means to "care" about stones. 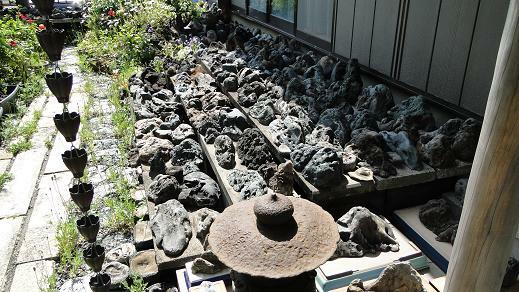 Stones kept in the garden are mainly landscape stones but also Hut stones (Kuzuya), suitable for Suiban display, of medium hard matrial found in rivers or found in the ocean which are called Kobi ishi. Stones just found in water are new stones called "ara ishi". The suface of these stones are created in water and these stones have never been exposed to sun light or air before somebody has taken them out of the water. Stones found in the water have either soft surfaces, ground and polished by the forces of the river or very rough surfaces, created by the ground water. These Stones have not been shaped by the forces of the river. At first, it takes a few years until such a new stone is completely dry. Until a stone is completely dry, it refuses to keep water but once it is dry (3 to 5 years) it will takes up the water like a sponge. This effect is called Mizumôchi. Hard stones like Kamuikotan, Sado Akadama, Setagawa, Abura ishi cannot become "mizumôchi no Ii ishi". 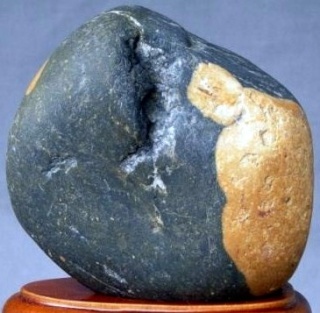 In Japan the best stones that are "mizumôchi no Ii" are Saji, Kamo, Yase, Ibi, Abe, Kibune, Kurama ishi. For Yôseki the stones are laid on wooden blanks in the garden and first of all exposed to the sun light which is the most important aspect of Yôseki and secondly watered with rain water once a while and the rain itself does its own. Over the years, the processes of watering, evaporation, and light will create a sort of erosion of the surface. Erosion literally means, the surface becomes fine pored and absorbs more light, the stone seams to become darker. In Japan they expose the bottom of the stone to the sun light one day per months. In 10 to 20 years one can see how well the yôseki has changed the stone's surface. After 20 years most of the stones have become suiseki, a daiza is made for it and the surface will not become better. The suiseki is then kept in the hose, in a box to prevent the surface to become dirty and dusty and its ready to be used for suiseki kazari. Hard stones and those traditionally not displayed in Suiban are kept in the house and once a while rubbed with a soft clean cotton cloth. This form of Yôseki also takes years to create a perfect surface with a deep gloss. In the west collectors prefer to speed up things and use polishing tools but a Japanese connoisseur will immediately see that its been polished by tools because the speed of the wheels only polish off the surface and does reach the pores in depth. Stones kept in house are hard stones representing landscapes like the hard stones listed above and stones representing persons like Kannon ishi, animals, boats and pattern stones and Biseki such as Akadam ishi and Kikka seki. Dich Benbow's stone I assume is to hard for garden Yoseki. Yvonne's first stone is ideal for garden Yôseki, the second one is far too hard as well. Thank you very much. Simple, interesting and instructive. Martin, I can't tell you how appreciative I am for your sharing . Thank-you, very helpful! Thanks for forwarding Martin's comments, Kev. Thanks, Martin!!! ... In the sharing of Martin Pauli,we find the deepest respect & appreciation for suiseki and Japanese-style suiseki practice. Martin Pauli is the clearest source for information on Japanese suiseki practice & his several publications sparkle. Corresponding with him is a joy. Martin separates his knowledge based on extraordinary experience as Matsuura's first serious Western student & as a client in high-end Japanese suiseki circles. He has seen stones as well as publications that are typically reserved for a few intimate suiseki associates and participated in discussions at levels seldom plumbed by enthusiasts. He isn't limited by polite expression to gloss over important details if his listener doesn't pick-up on subtle details, and it distinguishes his guidance. When Martin is not sure of a detail, he will clarify and challenge the need for discovery. Martin begins with appreciation of feeling for nature & finds its expression in the subtle display of stones in Japanese suiseki style. Descriptions on Martin's blog (LINKED HERE) of the stones illustrated in the new publication are extraordinarily insightful. I am very happy to read your words. I will go back and read them more than one time. I am sitting in Tokyo now, in the morning, ready to go to work. But yeasterday was I in Kyoto, and have spend a coupple of days searcing for stones in the Kamogawa...when I am back home in Denmark will I show 7 or 8 nice stones I found. I really hope you will talk again on IBC, as we need someone who can teach us more. You mention two of my stones, at the moment can I not remember them, but I am sure, it will come back to me. I enjoyed reading your site with all these thoughts you gathered and those lovely stones. Good to mention the different approach to life, different eyes see different things. it is a long river. It was very nice to meet you at Noelanders Trophy ....you are not easy to recognise without the cliff . A pity we did not have the time to talk, as many people came to the table at the same time. I hope to see you again next year. I have a question to Martin Pauli.Can you forward it to him?. I have been reading hes very nice homepage. And I have a question. Softer stones suitable for outdoor yoseki is displayed in suibans. Are they also displayed in daizas all year?. And after the surface has finished outdoor, are they then being treated with indoor yoseki, if the surface allows? Hi Yvonne, that was not me at Noelanders. I didn't get there. Perhaps you met Tony Tickle? Anyway...Please pass my questions on, Many thanks. I really hope for an answer.